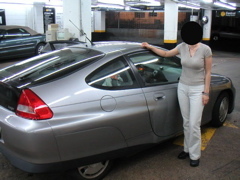 09/07/2003 Update: Two pictures with Belkin Auto Kit added. Click on the photos to see bigger images with comments. With my spanking brand new 30GB iPod, today I decided to set up all the wiring in my Honda Insight (Gas/Electric Hybrid) to accommodate this baby. In order to feed iPod's audio signal to the stereo, I got something called PIE HON-AUX from Logjam Electronics ($50+s/h). This plugs into the CD changer port of Honda OEM cassette/radio and gives you RCA stereo input. This is great because you don't have to buy a new radio/CD player with line-in jack to connect your iPod, and you don't have to compromise the sound quality by using FM transmitter. I also got Belkin Auto Kit for iPod ($40) which has audio line-out. These two are the perfect combo for my setup. To mount iPod, I used my old Arkon Cup Holder PDA Mount which I have been using to mount my PocketPCs. I also use iPAQ 3870 (Japanese version) sometimes for GPS navigation with Mapopolis software and Pharos GPS hardware, so few extra things were installed to accommodate that as well. I still haven't figured out the way to mount iPod and iPAQ at the same time. Maybe I'll update this page when I find the way to do that.